Natchitoches Young Professionals hosted a tie and blazer drive during the first Louisiana Young Professionals conference. Over 50 ties and 10 blazers were donated to NSU’s College of Business. From left are NYP board member Randee Knapp, NSU’s College of Business Assistant Professor and Coordinator of Outreach and Special Projects Carmela Parker, and NYP board members Carrie Hough, Micah Foshee and Sean Baylor. 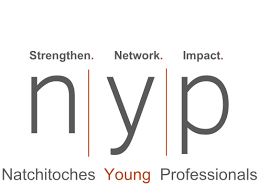 Natchitoches Young Professionals hosted a tie and blazer drive during the first Louisiana Young Professionals conference. Over 50 ties were donated to the CLTCC Business Boutique. From left are NYP board members Carrie Hough, Micah Foshee, Randee Knapp, Craig Caskey and Sean Baylor with CLTCC Dean Laurie Morrow.